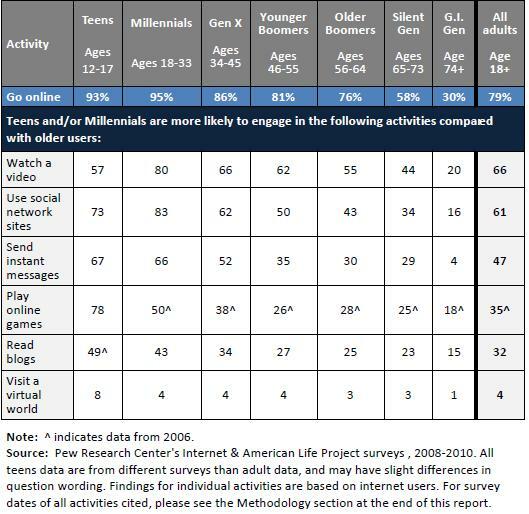 Pew Internet released a report this morning regarding how different generations are using the internet in 2010. Here is the full report and Mashable’s article. Since I manage the SMC Bloggers, a number of people at St. Mike’s emailed me the Mashable article. Blogging is dead! We need to be emailing prospects more! And look… IM’ing is making a comeback… clearly our Admission Counselors should reactivate those AIM accounts they once had. If one takes a quick glance at the (kinda weird) infographic from Pew on Mashable’s site, I suppose they could make the above conclusions. While the actual form of blogging isn’t a widespread activity, about 50% of the Millenial generation is reading blogs. It also appears that the younger you are, the more likely you are to read blogs and the more likely you are to watch videos online. As my insitution’s social media manager I have spent a lot of time cultivating a strong blogging and online video presence, this data encourages me to keep at it. I’m not sure if any of the folks who emailed me actually went in and looked at the report. If they did, they would have seen this graphic in the “Online Activities” section. The data in this charge has been collected over the past four years and it is clear that prospective students are going online and spending time reading blogs, watching videos, and social networking. Our challenge is in figuring out how to get a slice of that time for higher education.